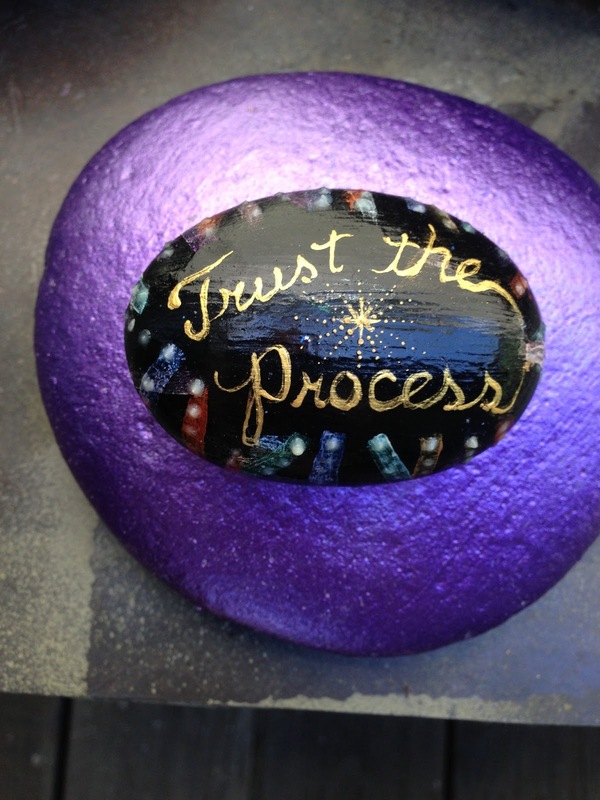 My friend who lives not far from me wrote this letter about his sister who is undergoing surgery for some cysts that have appeared on her ovaries.I had painted a rock with the words,"Trust the Process" that he was to give to her for her birthday. He writes... So Amy …… I'd suggest going through with the operation to be on the safe side.I’m sorry you have to go through this terrible ordeal.But at least it is a standard operation.Trust the process! Your guides wanted you to have that message that is why they led me to the stone. 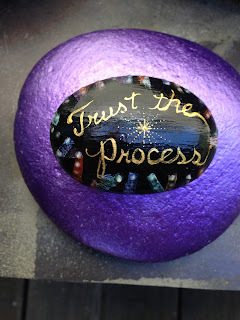 My friend who I had make the stone design came up with the idea of “Trust the Process”.It immediately resonated with me for some reason. Now I know why. You met him before in the restaurant at the resort.My neighbor,Chris. You're lucky.When I had my operation the doctor wasn’t even sure what the hell he was going to do! Be glad your not having someone doing an improvisation experiment with only hunches as YOUR life is hanging on a thread and half your colon removed... Then losing it on the table, and being lost for three months (in and out of consciousness and reoccurring seizures). Note:He is referring here to his own experience with personal surgery. Death is always to my left and never lets me forget it. Be it a warning to take control of your own health with prevention. Your’ll be fine ……you have a ways to go yet. 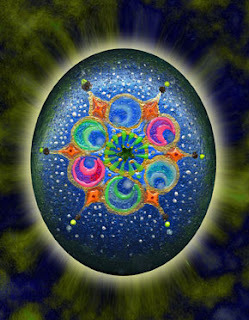 Much energy will be sent to you. No need to be scared. I keep my friend's sister in my best thoughts and prayers as I hope you do too. 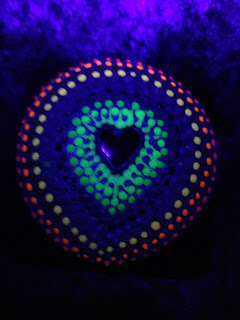 It is well known that I use glow in the dark paint on most of "Your Spirit Rocks !™" that I paint.This is the reason I have named them as such.If you have one on your window sill during the day, you get what some call the bling factor.This being a shiny metallic-looking rock with adornments such as glitter and mylar. Now,If you put the same rock on your nightstand under a small lamp you will get the glow factor after you turn out the lights. 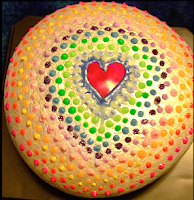 I have used florescent paint which is bright and colorful, but technically does not glow in the dark (unless you have a Ultra Violet Black light flashlight to illuminate it).These type of lights can be purchased for a small fee at some popular hardware and variety stores.The glow in the dark paint will absorb any natural or incandescent light and stay illuminated for a short while.It will eventually fade, but it is still visible in a dark room for most of the night. 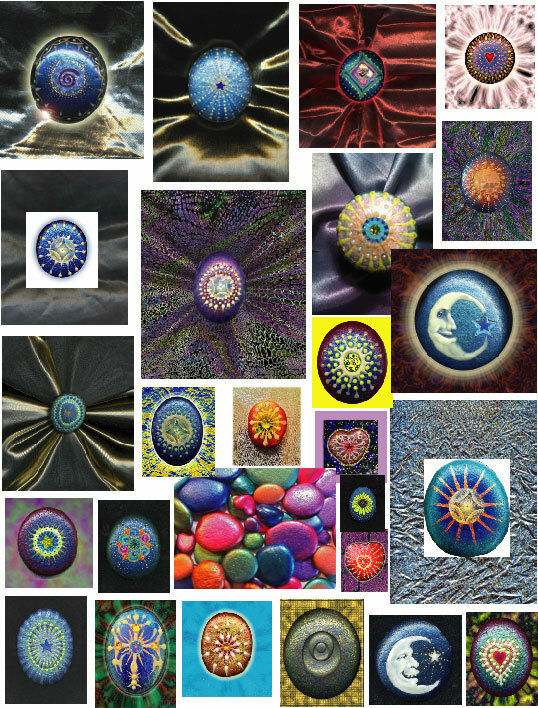 It gives me great joy to show off these unique gift items.The video link below showcases the rocks in various stages of illumination.Enjoy ! Usually, I will post one rock that has stood out as being a particular favorite "Rock of the Week". The composite image here showcases a whole variety of different rocks that have been scanned over the past three years.This selection illustrates the progression of the craft as it has developed. 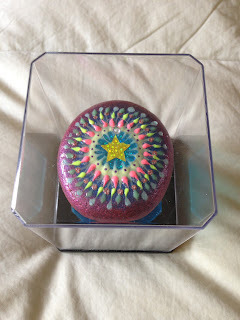 Yesterday, my sister Rita provided me with a bag full of goodies from Cliff's Variety Store which I can now use when decorating the rocks after being painted.This was Father's Day, but the gift was a belated birthday gift. (It should be noted that it was also St. Rita's feast day!) It was enjoyable having a feast of pulled pork sandwiches with cole slaw in my nephew Edward's back yard. We topped it off with some chocolate cake for dessert.I hope that everyone enjoyed their own versions of a Father's Day celebration. This rock is called "The Harlequin Rock" because it reminds me of the colorful garb you might find on a clown in the circus. The background was created in Photoshop and the rock is one of my favorites. Today was over 90º degrees in Calistoga and the rocks I had on display were so hot that people would immediately put them down if they tried to handle them.Needless to say, sales were not that good. 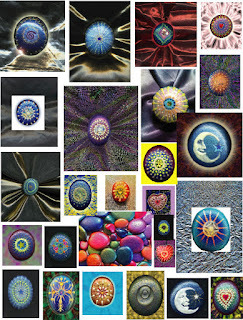 I would like to find a cool DARK spot to sell my rocks. Perhaps in a lounge, or some place like a cave.If anyone knows where I might find this ideal spot, let me know. Peace out for now. My good friend Veda took me to this great Japanese Dollar-fifty department store called "Daiso" in the Serramonte Shopping Center in South San Francisco off of Hwy. 280. We got there about ten minutes before closing and found these great little collectible boxes that would fit some of my favorite rocks perfectly. I can always count on Veda to find me some great deals and fun products.A bit later, we went to a Carnival near Mill Valley where we watched kids go down a super slide and ride the Ferris Wheel. She was drawn to the games of chance, and immediately bought a bucket of ping-pong balls to toss into these glass jars which would win her a stuffed animal.She even gave me a couple to toss. After spending about five bucks with no winning tosses we moved on. 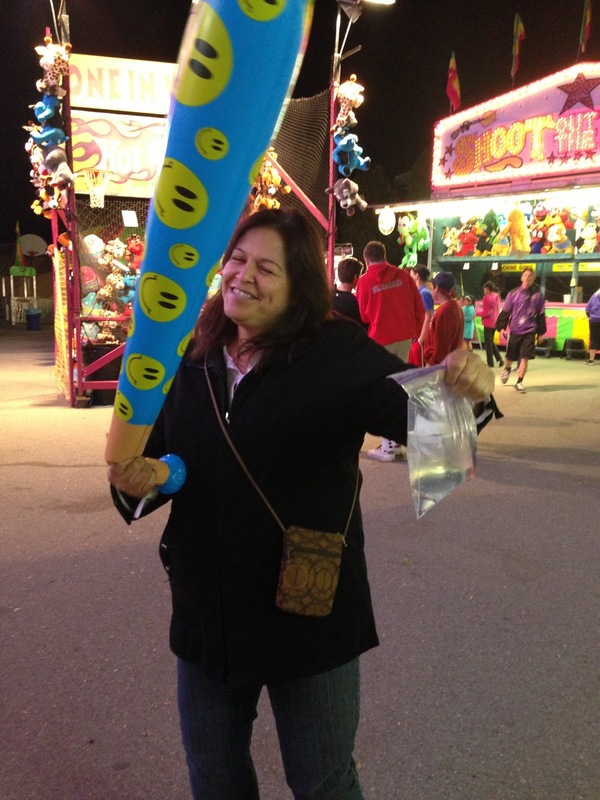 We did however, win a blow-up baseball bat and a tiny gold fish at the next game of chance. She chose to name the little fish "Ichi-ban" after the Japanese stores we had visited.Veda is just so cute and happy. She is totally in love with that fish,too.The picture below is of her in her moment of glory.